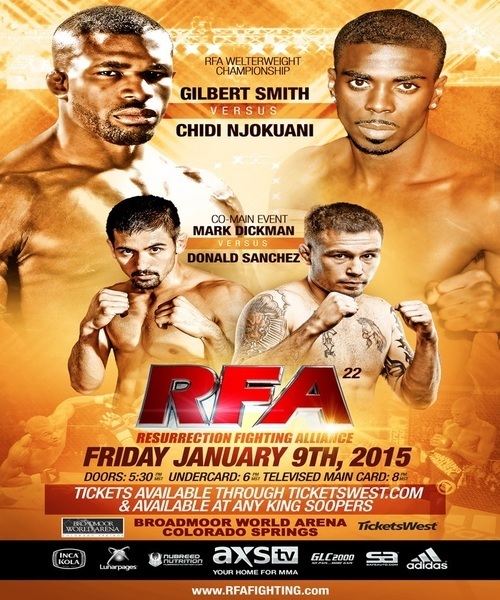 We are live at the Broadmoor World Arena in Colorado Springs, Colorado for RFA 22; headlined by Gilbert Jamal Smith battling Chidi Njokuani for the vacant RFA Welterweight title. *After missing weight yesterday Chidi Njokuani is not eligible to win the RFA Welterweight title, but Gilbert Smith who successfully made weight still is. Cody Yohn applied pressure got the take down. In the stand took the back landed a few punches, pulled Marcuk back down sank in the choke and got the tap. R1- Yohn lands a hard leg kick and eats a 4-punch combination. Yohn in a double leg scores the take-down. Yohn takes the back and has the body triangle. Vrecenar is trying to spin out but is eating leather. R2- Vrecenar landing nice single shots on the outside but Yohn is working hard to keep pressuring and scores a take-down off the cage. Yohn in full guard working his ground and pound. They are stood up. They exchange solid lefts. Yohn in on a double leg. Vrecenar jumps on a guillotine choke. Yohn escapes ends round on top. R3- Big take down from Yohn and he lands in side control. Vrecenar retains guard. They are stood up. Yohn blast a double leg and is back on top in guard. They are stood up and Yohn scores one more take-down before the final bell. R1- Gray jumps in scores a take-down. Eisenbraun cage- walks. Gray staying tight scores a 2nd take-down. Eisenbraun scrambles to his feet looking for a choke. Gray back to his feet clinches and puts Eisenbraun against the cage. Ther are restarted in the center. Gray gets inside to the This Clinch slams home 3 knees, changes levels and score the take=down. 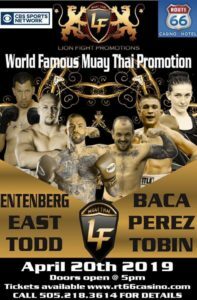 Eisenbraun cage walks they exchange knees Gray drops for a take down and this time as Eisenbraun cage walks he get caught in the guillotine choke and is forced to tap. Ri-1 They fight to the clinch exchanging in tight knees and elbows. A low blow stops the action. Montoya blitz’s in with punches hitting only air. Montoya pressures Heredia to the cage spins around to the back and scores a take down they scramble and Heredia makes it back to his feet holding a guillotine choke. Montoya escapes the submission attempt. In the clinch they exchange knee and punches. Montoya pumps a right hand and scores a double leg take-down to end the round. R2- Heredia deep on a single legs eats 3 elbows before completing the take=down. Montoya right back to his feet. Montoya wiffs on a pair of right hands and is out against the cage after a spinining heel kick attempt. Montoya in deep on a double leg lift Heredia who shimiy down the back. Heredia put Montoya on the fence and Heredia opens up with punches dropping Montoya to his knees. Montoya fight back to his feet eating big punches. Montoya holds on to the Thia clinch and makes it to the bell. R3- Alot of fainting. Montoya in on a take-down. Heredia defends. Montoya back Heredia to the fence as Montoya enters Heredia ducks under backs away. Montoya scores tyhe take-down and has the back in the scramble Heredia moves to mount. Montoya cage walks and they are clinches against the cage. Knee from Montoya back Heredia off. Heredia back in on the clinch takes another knee to the mid section. Montoya pressure Heredia to the cage scores the take-down and as Montoya takes the back Heredia scrambles. R1- Ingram triples up on kicks. Huber pressuring Ingram circles. Miss on a left from Ingram. Huber lands a knee a moves back out of range. Huber straight left right knee. Ingram miss with a high kick. Huber nice high inside knee. Ingram body lock and short knees to the thigh. Huber lands a left to the back. Huber gets hit with a low knee. Ingram misses a high side kick. Huber pins Ingram against the cage, scores a double leg take-down prior to the bell. R2- Ingram with 5 kicks out the gate but nothing landing clean. Huber with the take-down. Ingram gets his guard up high and Huber passes all the way to mount. Ingram regains half guar, but with a guillotine choke Huber moves back to mount and in a scramble Huber has Ingrams back; sinks in the choke for the tap. R1- Robinson slips into a take-down and has Musgrave on his back. Robinson looking for a guillotine choke is trying to slide into mount. Robinson tries to take the back Musgrave defends and is stuck on his back. Robinson goes for an armbar, Musgrave escapes. Robinson rolls, Musgrave is on the side ride landing right hands. Robinson escapes an arm triangle gets back to his feet. Musgrave lands a knee sending Robinson back to the mat, Musgrave moves to the back and pounds out the win. R1- Both man pawing with the jab. Dickman lands with a right hand scores take-down and is looking for a kimura. Dickman transitions to having a inverted triangle and Sanchez taps to the kimura. R1- Njokuani steps in with a right hand. Smith slips the punch. Right hand from Njokuani lands and he exits striking range. Smith shoots into a knee ona take-down attempt. Smith is in on a single leg. Njokuani lands with an elbow to the side of the head. Smith switchs to a double leg, lifts and slams Njokuani. Smith in guard stacks up Njokuani. Njokuani kicks Smith off him pops back to his feet. Smith in on a double leg scores the take-down even with a big fence grab from Njokuani. Smith in guard going body, body, head. Njokuani gets back to his feet as the round ends. R2- Njokuani starts off with a hard inside right leg kick. Njokuani backs Smith off with a teap up the middle. Smith throws 3 lefts ducks for a take down and Njokuani sprints across the octagon. Njokuani lands with the jab follows with a kick. Smith deep on a ankle pick Njokuani runs away. Smith is diving fro take-downs. 3 punches to the head and Smith has Njokuani clinches up against the cage. Wide base from Njokuani, Smith peppering away with short lefts. Smith in on a single leg and after some work rips Njokuani from the fence. Smith can’t hold Njokuani who is back to his feet and firing a high kick on the break. R3- Njokuani lands woith a body kick, Smith counters with a left. Smith big left hook and dives for another take-down then Njokuani runs from. Smith in deep on a double leg eats a knee to the body. Smith fires off a few short knees in the clinch. Smith pulls Njokuani from the cage, Njokuani sprawls and lands a few short punches. They’re restarted in the center straight from Njokuani. SMith dives on an ankle an Njokunai backs away from the take-down attempt.Series of kick followed by a right hand from Njokuani. R4- Smith in on the take-down and Njokuani just shrugs him off. Hard left outside leg kick from Njokuani drops Smith, who looks to have a possible leg injury. Njokuani follows to the ground in half guard. Smith trying to work a deep half guard. Gilbert sweeps and Njokunai scrambles back to his feet. Smith is in deep on a single leg.. The ref restarts them in the center. R5- Njokuani pumping the jab. Smith breathing very heavy. Not having wasted time making weight Njokuani is looking sharp bouncing, cutting angles and landing the jab. Smith in on a take-down meets a Njokuani flying knee. Smith hit with an elbow is now on his back. Smith works back to his knees tries to clinch, Njokuani pops back to his feet and lands a big kick to the body before diving back on top of Smith. Njokuani with peppering punches from the half guard. Smith in on a single leg is eating punches and they end Smith throwing one more big left and Njokuani fires right back.